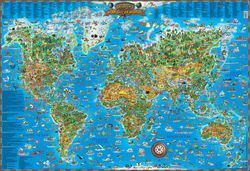 This world map for kids has country names, cartoon images of animals, buildings, scenic attractions and many other features. The images are numbered and cross referenced to a listing by continent, encouraging interaction with children to further their geography knowledge. For an added bonus, the ocean area depicts explorers, pirates and legends, sea battles, warships and other seafaring crafts! A perfect addition to any children's classroom or bedroom....and it's laminated for easy wipe off!